DETROIT -- General Motors is realigning responsibilities of two of its top executives, allowing GM President Dan Ammann to better concentrate on the automaker's development and deployment of autonomous vehicles. Ammann, who was already overseeing the operations, is relinquishing responsibilities of the Cadillac brand and GM's global portfolio planning to product chief Mark Reuss. The shift comes after several significant announcements in recent months by GM regarding its autonomous vehicle development, including a multibillion-dollar tie-up with SoftBank Vision Fund, a prominent technology investor, as it pushes to begin producing self-driving vehicles at scale for ride-hailing fleets in 2019. 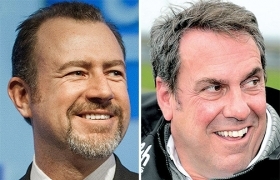 Ammann will remain GM's president, while Reuss' title will shift from executive vice president, global product development, to executive vice president and president, global product group and Cadillac. New Cadillac President Steve Carlisle and Sam Basile, who leads global portfolio planning, now report to Reuss, 54. The changes were announced internally Wednesday and are effective immediately. SoftBank will pay US$2.25 billion for a 19.6 per cent stake in GM's self-driving vehicle operation -- valuing GM Cruise at about US$11.5 billion, above some analysts' estimates. Ammann, 46, will remain based in Detroit. However, he will be spending more time in San Francisco, where the automaker's GM Cruise autonomous vehicle operations are based. He retains his responsibilities over GM's other brands, global regions and GM Financial. The shift is responsibilities also puts Ammann on track to potentially lead the operations if, or when, a spin-off occurs.